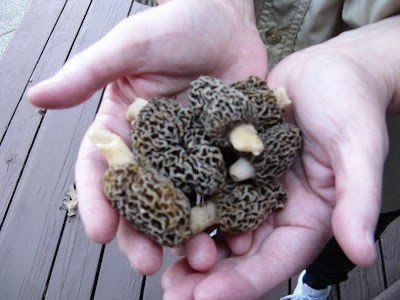 Cora Cooks: Morel Season - The Hunt Is On To Eat Locally! I got a call from my neighbor today. She and her husband were out foraging for morels and wanted to look for them in our woods. A little while later, she showed up at my door with pockets full of the highly sought after culinary delights. My picture is not the best, but they really were beautiful specimens. Phyllis reports these morels actually were found in some nearby woods, so all you morel hunting maniacs who know where I live don't need to waste your time traipsing around my woods. Phyllis says to prepare her morels she coats them in flour, salt and pepper, and then fries them in butter. So simple! Apparently, the hunt is a lot more involved and demanding than the preparation. A little Internet research shows that some cooks coat the morels in cracker crumbs, most fry them slowly in butter, and many recommend a cast iron skillet for cooking. Beyond this simple preparation though, there are more elaborate recipes for using morels in soups, sauces, and as a complement to all varieties of meats and seafood. I've never had fresh foraged morels, and I probably never will since I'm not a huge fan of their taste or texture. My morel-loving brother says he has given them up after having unpleasant reactions from eating them in recent years, and that's all I need to know. We have similar issues with reactions to certain foods, so now I'm reluctant to try them. For Christmas one year though, the same mushroom brother gave me a log for growing my own shitake mushrooms and that was a big success. Guess I just like my mushrooms more on the tame and mild side. But don't let that stop you from experiencing freshly foraged morels! Just be sure you know what you're doing before you eat stuff you find in the woods! The dedication of mushroom foragers who know what they're doing is enthusiastic and contagious. Several of my neighbors have taken mushroom-hunting classes and are experienced foragers of mushrooms and other wild foods (see earlier posts on autumn olives, persimmons and nuts.) I was excited to be involved with their hunt today, even in a small way, and to see and photograph their morels. I truly admire their knowledge and commitment to eating locally! Now that morels are here, can asparagus be far behind? That is some local eating I can dig into--and I know right where to look! I'll be stalking asparagus in some nearby gardens very soon. Have I told you lately how much I love my food-loving neighborhood? Hanging my head in shame because I never knew what morels were! But I AM excited for fresh asparagus. Counting the days until the Greenmarket is hopping again! Lucky you! I've only eaten them once, but they were delicious. That is really cool! I've tried looking for fresh morels at our farm, but haven't found any yet. However, we have planted two asparagus beds. The first one was put in 12 years ago, and thanks to the birds, we can now forage asparagus in a number of spots away from the two planted beds. I will be checking today to see if any little green sprouts are sticking up their heads.